Jillian Michaels showed her playful side while in Malibu with her family on Sunday. The celebrity personal, who has the reputation of being tough and imitating was anything but while out with her partner Heidi, son Phoenix and daughter Lukensia(Lulu). 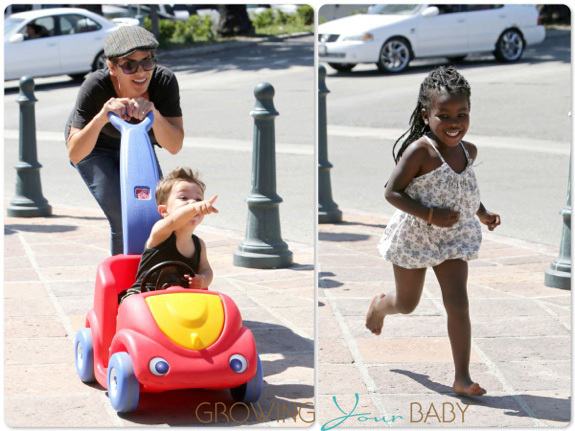 With her little guy in his ‘Push Around Buggy‘, Jillian chased a barefooted Lulu around the parking lot. The cute moment came after the family’s weekly visit to the farmer’s market. The moms picked up some produce and Lulu got a turn in the fancy car as well!